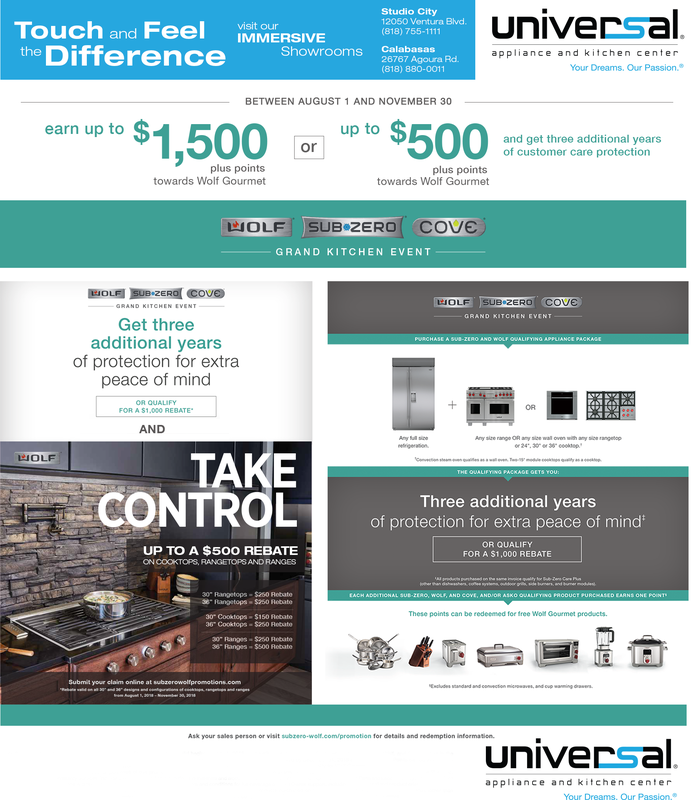 Up to a $500 rebate on cooktops, rangetops and ranges. Rebate valid on all 30” and 36” designs and configurations of cooktops, rangetops and ranges from August 1, 2018 to November 30, 2018. Do you want premium appliances with professional cooking power? If so, you need to consider Wolf appliances. Wolf manufactures a variety of cooking appliances including cooking ranges, cooktops, and ovens as well as microwaves and range hoods. The company also manufactures outdoor living appliances like barbeque grills and side burners as well as specialty items like warming drawers. Wolf began by producing professional, catering-quality appliances for hotels and restaurants, and has perfected the art of cooking with its premium line of modern kitchen appliances. Wolf appliances bring the power of a professional kitchen to your home, helping you achieve impressive results with every recipe. Moreover, the company’s appliances are as reliable as they are attractive. Wolf appliances not only look great, but they work great too. You’ll be impressed by the power and temperature control on Wolf cooking ranges and barbeque grills, and be even more impressed by the precise cooking power of its ovens. With a variety of styles, sizes, and designs available for every appliance, you’re sure to find the perfect Wolf product for your home. For professional-grade appliances with premium designs, be sure to consider Wolf. Universal Appliance and Kitchen Center offers a great selection of Wolf appliances, helping you find the perfect new selections for your home. Be sure to shop our wide variety of cooking appliances and outdoor living appliances today.